At the edges of civilization, they prowl. Their Beasts rise close to the surface, sniffing for sustenance. Loners and pack animals alike, the Gangrel are the untamed Savages among the Kindred. Though they are primal blood-drinkers and howlers at the moon, their animalistic allure is not to be denied. 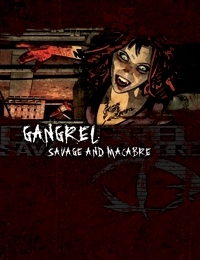 From the urban jungle to the wild places unwalked by other vampires, the Gangrel are there. Prepare yourself — it’s time to run with the pack. • Discover the origins of the Gangrel, in the days before Rome, in the deep wildernesses of the steppes and great forests. • Delve into the secrets of the Red Surrender, the Gangrel technique for riding the razor’s edge between true Frenzy and iron-clad self control. • Be immersed in the lore and tales of the Gangrel from contributors both mortal and immortal from around the globe. Discover what else the World of Darkness holds, wicked and growling, in its nights.